me- trying to chase down full Life, and working out where type one diabetes, and everything else, fits in. I was trying really hard not to swear. also, this may make more sense if you know that i had an amazing biology teacher in high school who would introduce new terms to us as suitable substitutions for swear words. I think she would have been proud of me. This post is a little overdue (by 6 months), but whatever- my stories, my schedule. Or something... The thoughts and emotions remain valid.. So in one of my previous posts i mentioned that my last bunch of lab tests were... Interesting. Everytime i get blood drawn for an appointment with my doctor, she tests my HbA1C, my lipid profile, and my TSH (thyroid stimulating hormone) levels. Once a year or so she tests for a whole bunch of other stuff. But for my regular blood draws, those are the golden three. I had tests done towards the end of last year and lipids and TSH came back normal and my HbA1c was hugely improved (yay!). Fast forward a few months to my next bunch of pre-appointment tests at the end of april this year: my TSH levels came back high. Like, 10-times-what-they-should-be high. Like, good glory, how-are-you-not-falling-over-puffy-skinned-and-where-is-your-goitre?? kind of high... (and with it some less than ideal lipogram results, and an unchanged HbA1c- well yay for that at least?). Some more tests (which I had to pester my doctor for a bit more than i would have liked, surely confirmatory tests should be normal before you make a diagnosis? Otherwise it's just an assumption? A well educated guess?) confirmed that i did indeed have elevated antibodies against my thyroid, and lowered T3/T4 levels. I know that this is not, technically, a big deal. I know that hypothyroidism is relatively common among women in general, and that a lot of people with type 1 diabetes have hypothyroidism. And i know it's easily managed. A pill, once a day, every day for the rest of your life, and you're A-OK. Please, in comparison to testing blood sugar 8-10 times a day, multiple injections or pumping insulin, lowering highs, raising lows, watching what you eat and making sure to get regular exercise- and avoiding lows in the progress? In comparison, one pill a day and regular blood tests (which i do anyway) is nothing. Really. I am not overly upset or stressed about this. Exhausted, maybe, at the thought of having one more thing to deal with. Exhausted, just in general? I confess, there is something particularly disconcerting about realising that , despite all your efforts to control a pre-existing chronic condition (diabetes), your current lifestyle is so unhealthy, so high-paced and high-pressured and so sleep-deprived; that you assume it's perfectly reasonable and normal to feel as crap as you do, to be permanently exhausted, emotional, stressed out and on-edge, that you don't even recognise the way you feel to be symptoms of a disease state. Surely, surely, there's something wrong with that? And, perhaps, something wrong with the post-graduate research system, or the research community, and maybe even society, that we encourage and reward people who live like this? Maybe? (ok, perhaps that's a tirade for another post). Aside from my exhaustion, there is a slight sense of mourning, a sense of loss that doesn't particularly make much sense. I'm already used to having one endocrine gland that doesn't work all that well, and resigned to living with it for the rest of my life. So the life-long aspect of hashimoto's is not a big deal for me. Maybe its more just the fact that i was so young when my pancreas died that its just always been my "normal" for me. This is the first time i have to consciously realise and accept that a part of my body that was working just fine not too long ago is now defunct. Dead. No more. And with it, my body has lost one more tool available to it to fine tune and regulate my metabolism and maintain homeostasis. And so, even though i can just take eltroxin and carry on and this doesn't really affect much else, on the other hand, in a myriad of small ways, this affects everything. And that makes me a little sad. Perhaps the bigger over-riding reaction to this, that has simmered down since april but remains always lurking in the background, is a loss of faith in my immune system. No, make that the gain of a deep sense of suspicion of my immune system. For this, perhaps a bit of background information may be useful. I am the only person in my family with diabetes. Among all the aunts and uncles and cousins and grandparents, parents and siblings (ok, i only have one sibling, but that's besides the point), i'm the only one. There's not type two diabetes in my family either. Nothing. It's just me. This may strike people as unusual, but there's another clear pattern in my family which makes perfect sense. Autoimmune diseases. Almost exclusively from my father's side of the family, there is a very strong pattern of autoimmune disorders, big and small. Besides my diabetes, there's addison's, lupus, hypothyroidism, hyperthyroidism, hypoparathyroidism, otosclerosis, scleroderma, vitiligo, dermatitis and rheumatoid arthritis- all autoimmune linked. And that's just the stuff i know about. My point is, we do autoimmune diseases. You may as well make us t-shirts. Up until this year, i had mostly just accepted diabetes as my portion of these lovely (<-- sarcasm) genes. I figured my immune system had chosen to pick on my pancreas, it got that genetic aggression out of its, uh, system, and now we can all move on with life. Not so much apparently. With a hashimoto's diagnosis, it's not longer just diabetes. I now have diabetes AND ---. l'm now more complicated, more high maintenance. And more at risk of more autoimmune crap. A lot of people get no more than the diabetes-hyothyroid combo. But some others go on to get a third disease, usually addisons. Its common enough to have a name: poly-glandular autoimmune syndrome. Knowing this, and knowing my genetic background makes me nervous. I had some extra tests done when my hashimoto's was diagnosed, and nothing looks unusual so far. But i know i need more extensive tests done. And most probably semi-regularly from now on. In the mean time, it feels like there's always a constant worry in the back of my mind. i no longer trust my immune system to stay at bay. I don't trust it to keep me healthy. I supplement my diet with a whole bunch of stuff, including high quality, high dose omega-3 FAs (EPA and DHA). I'm trying to exercise more. I'm trying to reduce my carbohydrate in take (although i'm not completely sure i buy the whole low-carb thing- more research into that is on my to-do list). I'm trying, really really trying to minimise any levels of inflammation in my body. I've tried to not be too stressed about my thesis and up-coming exam (way easier said than done). And everytime i don't feel that great, feel a little more run-down or emotional than usual, a little more drained and tired, every time i get a joint or muscle injury that resurfaces or just won't clear up; a little bit of that worry resurfaces. Just for a moment. But it's there. I finished my thesis/dissertation/monster... Submitted end of August.. Phew! Since then, i took a too short but much needed holiday in durban, visiting two of my favourite peoples, my brother and TUE (I would insert some photos from the trip. Except this is unnecessarily complicated to do from my iPad, and I'm lazy. I admit it. ), and have been oscillating between catching up on much needed sleep and frantically preparing for my oral exam/defense.. Which was potentially going to be this week. Seeing as I found out yesterday that its in the beginning of november I can breathe a bit, maybe write some blog posts (?) and keep studying, because i'm so not ready yet... But i'm nearly there. I'm nearly finished. this bumpy three-year ride is nearly over. The end is in sight. Today has been a stormy, gloomy, rainy day. I love such weather, its the perfect punctuation to our mostly bright and sunny heat. And with it all comes some of the familiar and not unwelcome melancholy as well. I've been looping the Jars or Clay Furthermore double album all day. This is some of my favourite music, heavy with emotions and memories for me- and perfect for this weather, and this time of year- there are just so many memories to link the two, good and bad. i *knew* there was legitimate reason for me to be craving a cupcake this afternoon! Darn, should've gone with my gut (pun?). Instead, sans cupcake, this anniversary (pumpaversary?) was marked by me making a rookie-mistake: i inserted a new infusion set without pulling those little tabs off the sticky part. Doh. Trying to pull those guys off while trying to keep the needle stable and stuck in your skin is no small challenge! -I love love love my insulin pump. -Seeing how much i can fine tune my doses- basal and bolus- makes me realise probably just how bad my control must have been on MDI. And has me thinking, seriously, how does anyone manage to manage diabetes properly on MDI? Unless you just stick to a robot- type of routine?? -Not that everything is perfect with a pump all of a sardine. It's still diabetes. It still throws curve balls. For the most part, i still feel like a rookie at the whole thing. There's still a lot to work out, and rework out. And adjust. Again and again. The cool part? It's so much easier to do that with a pump..
-I'm till trying to work out what to do with the pump when i wear a skirt or dress. i'm still working out good spots for infusion sets and cgm sensors. I'm kinda small , so real estate is a litlle limited. Plus, to be honest, the needles do still make me kinda nervous. So it takes me a while to psych myself up to trying a new spot. I'm working on it..
-On the topic of sensors: as much as i love my pump, one thing that i thing has made the hugest (is that a word?) difference to how i try manage my diabetes has to be the cgm (i've got the medtronic veo with integrated cgm, so this still counts as being about pumping). Holy cupcakes, batman! i love having the real-time in context information. No it's not perfect. But it helps. I have yet to go anywhere near any sort of software that will help me analyse trends or anything, but in the day-to-day, meal-to-meal, moment-to-moment-ness of this disease, the cgm is awesome. Seriously. -After a year of pumping (ok, only 9 months with the veo pump, but still) i have yet to name it. 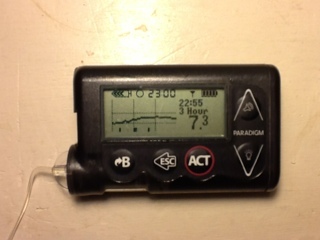 My cgm transmitter has a name (joe, if you're wondering). But i have yet to think of something suitable for the pump. Any suggestions? So... I've missed some opportunities to go backbacking, and to visit some friends far away. I missed D-blog week (which made me sad). And, apparently, the one year mark from me starting this threadbare blog (blogaversary?) (which i'm ok with). I very nearly missed mother's and father's day, and some friends' birthdays.. No wait, i missed a few of those too. Most recently, i missed an opportunity to go to cape town for a few days. And lately i've been missing a friend who moved to london earlier this year (but that's a different kind of miss). All of those are just noticable chunks of life, which stubbornly carries on when you're frantically trying to meet deadlines and finish work. Me, i finally finished up experiments (ok, i may have just decided to stop, and stubbornly refused to do any more.. In a hopefully nice and respectful kind of way..) wrote for a month and a half and finished the first draft of my thesis/ dissertation. I'm still not sure what i'm meant to call it- it's the 150 page-long culmination of the past two years of lab work and research (literally blood, sweat and tears), but i'm only getting an MSc out of it (i would feel slightly cheated about this, but i'm mostly just relieved to be coming to the end of this process). It's not over yet- i still have much work to do (my supervisors collectively chewed it up and spat it out gave me a lot of feed back, comments and corrections on the first draft), but this is the end stage of the work. A stage that i at one point seriously didn't think i'd ever get to, so i'm grateful even as i sit re-writing entire sections. You can miss a lot of life when you're stuck behind a computer for a month and a half. Health stuff, however, carries on. Diabetes isn't a fan of being ignored for even a day. Let alone over a month. I adjusted basals, i tried to exercise kind of regularly, i made an effort to eat real food, as opposed to student-style junk food. Thinking back over it (logging is not my strong point), i think i did mostly ok.
And i still had to make doctor's appointments. I had an HbA1C test, which was ok, and other tests, which were not so ok, and worthy of a whole other blog post. I had an opthamologist check-up. My first one since 2008, he was keen to point out to me. Woops. I clearly still have appointments to catch up on since my freak out last year. Thankfully, grace abounds and all is fine in the eye department. Phew. My latest health adventure? I managed to pull off the crown of a wisdom tooth yesteday while flossing (that's nearly as gross, but strangely not as painful, as it sounds.) i'll keep the further gorey details to myself, but i'm minus a wisdom tooth, drugged up on antibiotics and painkillers, and consigned to a liquid diet for a few days (yup, that's just great for controlling blood sugars). Way to make a weekend- soups and yohurt and thesis corrections, in between myprodol naps. a bit of an oddball. nerd, introvert, wonderer, wanderer, researcher/student, imperfect but loved child of GOD. diagnosed at 4-and-a-halfish years, i’ve had type 1 diabetes for 20 years, and counting. i like to think i’m on a hunt for Life to the fullest, whatever that means, with a love for photography, dancing, crazy dreams and ideas (and clearly not capital letters) all in tow. yes, and diabetes. I like to think of myself as a relatively intelligent and informed individual and patient. BUT i'm a biochemist, not a doctor (dammit, jim) and therefore while i hope any facts i post here will be scientifically accurate, they can and should not in any way, at any time, be interpretted as medical advice. That would just be silly. What works for me, or anyone else, may not work for you, or anyone else. So even if something i say here sounds really smart (ha), or stupid, or whatever, please go speak to a real medical professional before acting on it. K, thanks. all this blog stuff are belong to caron. you probably can use it, but make sure you ask her first. Travel theme. Theme images by digi_guru. Powered by Blogger.